POOLTUX Safety Covers resist whatever Mother Nature throws at them! These high quality pool safety covers will protect what’s most important to you – your family – while providing superior protection for your investment! WE ARE YOUR SAFETY COVER SOURCE! Free Shipping on all PoolTux Safety Covers includes Custom Covers! 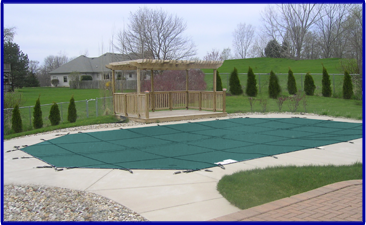 POOLTUX Safety Covers are individually designed using the latest CAD technology and stitched to fit your swimming pool perfectly. They are easy to install, keep your yard looking great in the off-season and allow for nominal prep and cleaning when you’re ready to open your pool in the spring! Take advantage of the Recovery Xpress Program for safety cover replacements. Pay only $150 for our safety cover template return kit. Your $150 will go towards your new cover at the time of purchase. If you don’t like our quote only pay return shipping for your old safety cover.